THE EUROPEAN COUNCIL has agreed to delay the date by which the UK leaves the European Union by almost two months if the Withdrawal Agreement is passed by the UK parliament next week. If the agreement is not passed by the House of Commons the new deadline will be 12 April and Britain will be expected to indicate a way forward to the European Council before that date. At that point the UK will face the choice of participating in the European Parliament elections at the end of May or else exiting the EU without a deal. 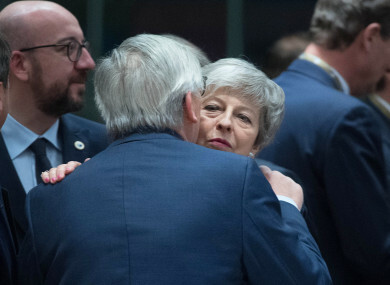 Following lengthy discussions in Brussels the 22 May deadline was unanimously agreed upon by the 27 leaders of the European Union’s member states as a number of possible rumoured deadlines circulated ahead of, and during, the meeting today. UK Prime Minister Theresa May had sought an extension until the end of June. Speaking at a press conference after the agreement was announced the President of the European Commission Jean-Claude Juncker said the EU is ready for all outcomes, including a no-deal Brexit. In the conference the President of the European Council Donald Tusk said the UK now has four options: a deal, no deal, a long delay or revoking article 50. The 12th of April is a key date in terms of the UK deciding whether to hold European Parliament elections. If it has not decided to do so by then, the option of long extension will automatically become impossible. He added that the meeting has left him more optimistic about the outcome of the Brexit negotiations. Theresa May refused to select her favourite of Tusk’s four options when asked about it in her own press conference, however she reiterated that she will not countenance revoking article 50. The British leader welcomed the EU’s decision to delay Brexit and said the British parliament now has clear choices about what to do next. “I hope we can all agree, we are now at the moment of decision,” she said. It had been argued that there would be legal implications of granting an extension to article 50 beyond the European elections. Agriculture Commissioner Phil Hogan had said previously that the EU’s legal advice is “there would be European elections in the UK if an extension was granted beyond 23 May”. The draft Withdrawal Agreement next week has already been rejected twice before – first by an historic majority of 230 votes, and then by a majority of 149 votes. It’s expected that a third ‘meaningful vote’ will be held next Monday or Tuesday. If the deal is rejected for a third time, it’s not clear what would happen next. French President Emmanuel Macron was among those who said that a vote against Theresa May’s deal would lead to a no-deal Brexit. Email “EU agrees to delay Brexit until 22 May if Withdrawal Deal passes next week”. Feedback on “EU agrees to delay Brexit until 22 May if Withdrawal Deal passes next week”.